I've been trying a variety of pay online, pick up in person services. First a mirror from Home Depot, then some party tins from the Container Store, but I have to say today's pick up from Baked by Melissa was the most satisfying. They sent me precisely one email to confirm three days ago, I walked in this morning, said my name and BAM, bag of cupcakes ready for me to go. In addition they efficiently and quickly accommodated a last minute impulse buy of two chocolate covered coffee caramel cupcakes. And boy am I glad I gave into impulse. 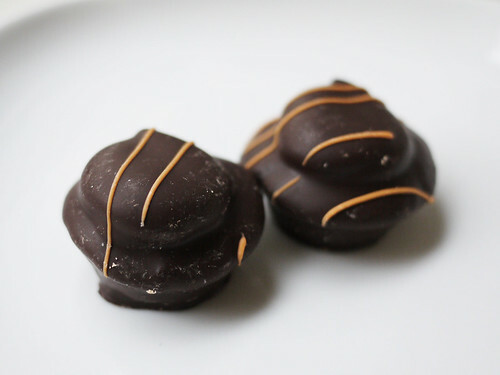 These little darlings remind us of Hostess Hoho's, only small, better, and coffee flavored. So yum. I've always been so offended by the size of Melissa's cupcakes, but covering them in chocolate is GENIUS. I pass the Grand Central location every day and ignore it, but I'm suddenly tempted. Hello @donuts4dinner! So nice to hear from you! You should be tempted by these, however, yes, you will be wanting more if you just get one.